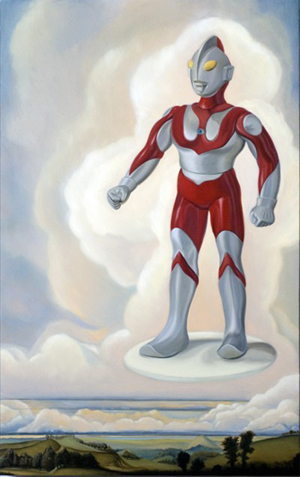 The Great Ultraman, 18" x 28"
Of his work Thompson writes, "My recent work focuses on a paradoxical and whimsical combination of still lifes and narrative paintings. Using toys (and objects of absurdity), my work can be viewed as either still lives of toys, or as scenes from great dramatic historical fictions starring heroes and villains that happen to be playthings of my childhood. The toy paintings address several issues. One is a question of identity, as in how I interpret their role as a nostalgic part of my childhood. For example, GI Joe was a potent symbol for me of acting out a masculine identity, as well as a very desirable toy. Mr. and Mrs. Potato-Head represent puzzle solving and creative, as well as a comforting reminder of domesticity. Another issue that I address in the toy paintings has to do with veracity of subject matter - because it takes close scrutiny to learn that they are in fact still lives, and not scenes. They can be either or both. In addition to this, I incorporate a juxtaposition subject matter, with the organic, such as a flower or landscape, paired with the artificial or manmade. I want to express this ambiguity or unknown of "why" these two different objects have this relationship or why they don't. To me they represent the void within a human condition or desolation in all of us."